Laura, over at Oh, How Pintearesting! has started a monthly SLP link up. 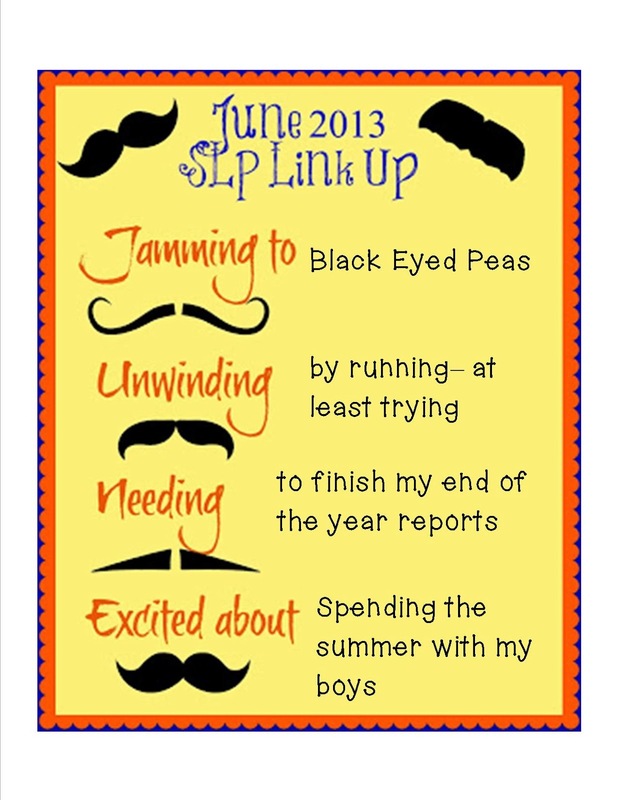 This month's theme is Fathers Day (notice the mustaches?). You can participate in this link up by visiting Laura's blog. Jamming to: The Black Eyed Peas. I am trying to find more music to run to, but I always come back to these guys (and girl). Anyone have some good ideas for music to run to? Unwinding: By running. Ok, so I haven't been great at this lately, but I am really trying to get back into it. I've also been spending a lot of time sitting at baseball and soccer fields watching my little guys playing their favorite sports. Needing: To finish my end of the year reports. I haven't even started my progress reports for all of my students. Need to get on that this week! I am also super excited about all of the great products I snagged in the SLP's Care for OK bundles that I purchased this week. I need to start printing and laminating! Excited About: Spending the summer with my boys. I have two boys at home. They are 5 and 6, and so much fun! I can't wait to spend the summer with them! I am also so excited about how much money we have raised so far for the SLP's in Moore, OK! As of today, it is over $10,000!!!!! You can link up with this by going to Oh, How Pintearesting! If you don't have a blog, you can comment below! What are you jamming to? You can help me find some new running music! I usually do the C25K program over the summers, but this year I'm thinking of starting earlier. I'm trying to remember what's on my playlist, but drawing a blank! BTW, I'm working on my EOY reports...blah! Enjoy your summer with your boys! Running, hmmm... maybe you'll inspire me. I need to get on the elliptical, and I usually pick a songza playlist. When does your school end? I just finished progress reports yesterday, and it was such a great feeling! My last day is Thursday. I am with you on the printing and laminating! So many goodies from the bundles! Ill have to check out songza- I haven't heard of that before. We are done next week. Enjoy your summer too! Just keep telling yourself that the end is near. Sounds like you will have a great summer with your boys. I have to wait to laminate my new downloads next year since my school ran out of laminating film. Enjoy your summer!! Good luck getting the reports done. I usually do audiobooks when I'm working out since it motivates me to get to the gym to hear the next part of the story. I do a lot of old school techno-like Rhythm is a Dancer (which isn't my favorite otherwise) for running since it has a good beat. Hey Jen! Hope your work comes to an end quickly so you can start having some summer fun with your kiddos! I have 2 boys, too. Boys are so much fun and they love their momma :) Good luck wrapping up the school year! Hello! I don't think I've seen your blog yet! I was running a lot last year but my allergies/asthma got so bad I had to stop. I walk a lot now and recently bought a FitBit to keep track of how many steps I take a day. It's awesome! Hope you get more time in running, love the Black Eyed Peas! I might be walking back down the aisle at my wedding to one of their songs my fiance and I both love! Meet me halfway!! Enjoy your summer! Thanks for checking out my blog! I have been wanting a fit it for a while, but haven't bought one yet. Maybe this summer. I'm sure your wedding will be amazing! Have fun with the planning! I have the Nike running app that I like. It uses the GPS on my phone to track the miles. Which ones do you use? I started a boot camp class today, and realized how out of shape I really am! I need to get moving!!!! I would love to have a running buddy to help me stay on track. That's so exciting that so much money has been raised for OK! Makes me happy to know that there are so many wonderful people who work in our field!